The name Aspull is derived from Anglian sources. 'Asp' (a tree) and hyll (hill) when most of Lancashire before the conquest was either forest or marshland. The earliest historical reference to Aspull is 1212, when it is referred to ploughland suggesting that it had been fairly recently cleared of trees and it's tenants were living by farming. These families were the de Lathoms, Inces and Gerrards. Inthe middle ages the district was the center of frequent disputes between the neighbouring barons and knights such as Sir William Bradshaigh of Haigh, the Radcliffes and the Hollands of Newton and Upholland, all of whom were murdered by their enemies. Peaceful settlement of disputes was not the custom until Tudor and Stuart times, when the Bradshaighs and the Gerrards were quarreling over the coal pits of Aspull. These, added to the farming of the district , supported a growing population and even an 'ale-house' which regrettably, was not kept in a manner satisfactory to the Magistrates. There remain in use several of the substantial farmhouses of this period - Kirkless Hall, Gidlow Hall, Pennington Hall, and Highfield House - whose owners in the past were notable Puritans, Catholics and supporters of the Established Church. The Industrial Revolution increased the demand for coal and greatly enlarged Aspull and brought to it what what was then the worls biggest limited company - Wigan coal and iron company - which boasted that it made everything it needed, ships and railways included. Soon after 1918, however , it was a victim of the trade recession and began to curtail its activities here until it's closure. Now little remains to be seen of the once gigantic works or it's six blast furnaces. In 1796 James Leigh prepared a map for Lord Crawford which is still in the posession of the family and which is drawn on joined sheets of vellum to a scale of 3 chains of 32 yards each to an inch. This is compatible with the Cheshire acre of 10,240 square yards. Many leases of that time, required payment for coal worked to be at a rate of so much per foot thick, per Cheshire acre. On this map the fields are named. There was no St. David's but the field on which the church was later built, was called Great Francis Moor. The field across the road, behind the school was Brow Hey and Butcher Field later became Butcherfield Row. Down Haigh Road on the left was Barn Hey and Wall Hey (later the site of Wall Hey pit). Haigh, which was then called Lane Ends, consisted of only a few buildings. The old Hall, (rebuilt 1830 - 1850 by Earl Alexander Lindsay) was fronted by ornamental water and an avenue of trees. By 1796, the almshouses (The Receptacle) was already built, as well as the Moat House and the old Haigh School. There were numerous small coal and cannel pits but there was a complete absence of tram and rail roads. The first official Ordnance Survey was made of the Haigh district about 1840 and was published about 1846. At this time Haigh was still named Lane Ends but by now St David's had been built as had the Brewery, the Balcarres Arms, and the Red Lion. There was a smithy near the site of the present Our Lady's and the present Haigh School was built, but much of Brow Hey had disappeared. Haigh Road was still a footpath. The area had begun to take an increasingly industrial aspect. Haigh Saw Mills at New Springs was connected to Spring's Branch line and there was a railway system extending from the canal to the cannel pit which later became No.5 Moor Pit, and from there to Heathfield Pit. Wall Hey Pit was still working. To the North there was a railway running South from Grimeford through Aberdeen, passing the coke kilns at Fir Tree House and reaching as far as William Pit, with a branch line down to the canal. There was no Meadow Pit. At Bauk House there were old tramroads to the canal running from Dainty's tunnels to the King Coal Mine. There was a bleachworks on the site which later became Alexandra and Lindsay pits. Kirkless, (top place) was still just a group of buildings around a coal pit. Marsh House and Woodshaw were still green fields and at the Finger Post there were stocks and a weighing machine. 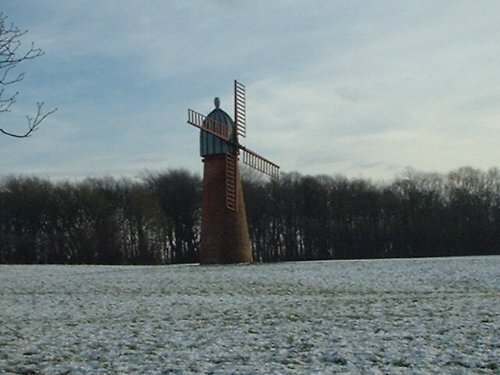 Brock Mill and Leyland Mill were a forge and a foundry, respectively. Haigh brickworks was in Hall Lane, near Haigh Cottage. There was a large colliery at Arley, a paper mill at Worthington, (later to be the B.D.A. bleachworks) and Aspull Copperas Smelting Works at New Springs. Dukes Row was then named Fothershaw Row, there was a workhouse near to the Fingerpost and Lower House Farm was described as 'The Lower House'. By the 1930 edition of the O.S. map, Aspull has become a busy mining center, with Meadow Pit, Crawford Pit, Alexandra, Lindsay and Scot Lane Pits. Pits to the North of Brinks, Abderdeen and Arley have gone but a mineral railway is still shown running through Grimeford Bar. The Lancashire Union Railway line from Hindley passes Alexandra and Lindsay pits on the way through the plantations to connect with the old North Union Line at Standish and the old Bolton and Preston line at Adlington. Marsh House and Woodshaw have disappeared (spoil heap) and the old No 3 Moor Pit has vanished without a trace. The land had reverted to moorland. Lower Highfield, in 1846 surrounded by a moat, is shown as remaining. Hilton House has become Hilton Farm and Fothershaw Row has adopted the name, Dukes Row. Haigh is no longer called Lane Ends, Butcherfield Row has been built and Haigh School is now Old Haigh School. The middle row of the old Arley Collieries now stands alone in the middle of nowhere, deserted by one time industry. 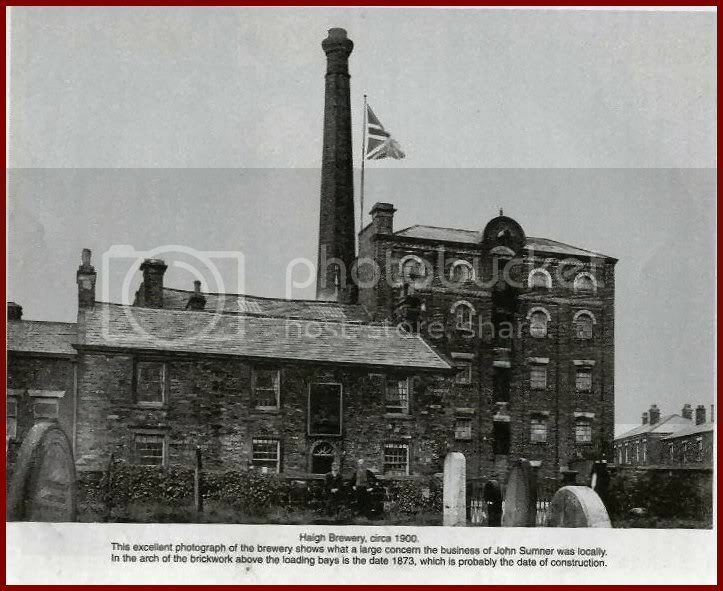 Haigh brewery was a five storey building standing behind the Balcarres Arms public house. The brewery was owned by John Sumner and his family who lived adjacent to the brewery in Haigh House. The Wigan directory for 1869 refers to Henry Rawcliffe, brewer, (John Sumner & Co.). 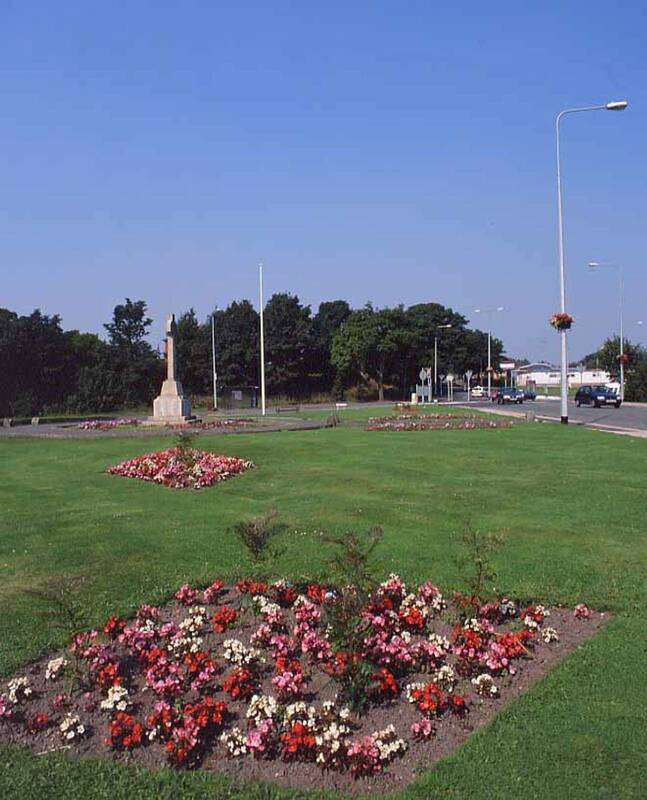 The Rawcliffe and Sumner family were realated by marriage although there was not a seperate Rawcliffe company the family traded under the sumner name. When Augutus Rawcliffe died in 1919 the two companies merged. St. Margaret's Church, Pennington Green. St. Elizabeth's Church, Higher Gullett. - Rev. Robert Walmsley, vicar. Roman Catholic. - Rev. Edmund Crook, priest. Crook Rev. Edmund, Church street, Haigh rd. Balfour Dorothy, beer retailer, 53 Stanley rd. Bolton Jane, beer retailer, 121 & 123 Wigan rd. Cook Luther, surgeon, Holly terrace, Haigh rd. Forshaw Richard, shopkeeper, 125 Wigan rd. Hensall Jos., hardware dealer, 81 Wigan rd. Hodkinson Thos., beer retailer, 29 Stanley rd. Leigh Roger & Co., Ltd., colliery proprietors, Hindley Hall Collieries. - C. Beazer, sec. Pickering William, shopkeeper, 36 Wigan rd. Pilkington Thos., shopkeeper, 145 Wigan rd. Powell Frederick, joiner, builder, & saw mill proprietor, Woodfield st.
Sherrington Jane, shopkeeper, 44 Longfield st.
Winnard William, shopkeeper, 32 Wigan rd. Worrall William, beer retailer, 38 Ratcliffe rd. Worsley William, shopkeeper, 70 Longfield st.
Aspull Pumping Pit has been commenced at Aspull for the purpose of draining the Cannel and King Coal Mines and concentrating the several pumping establishments now at work for that purpose. This will be more efficient and more economical. By an agreement with W Woods & Son, and in consideration of an annual payment to the company (£500), the water from Woods Scot Lane Colliery will be pumped at this new pit. The pit shaft was 21ft diameter and a wagon road had been laid to it from the sidings at No5 Moor Pit. A waterway was constructed in the King Seam from Scot Lane Pits, past Woods No4 Cannel Pit to the new pump lodges in the King Coal at the pumping pit. In December 1872 it was stated that the quantity of water has been greater than we anticipated. Three large, direct acting steam engines with inverted cylinders were erected to work the 20-inch diameter ram pumps at this pit. The water in the Cannel was good clean water suitable for steam boilers and it was pumped to the surface by the ram worked from an offset on the spear rods. It was used for the locomotives and for the boilers at the pit. All three engines were fitted with condensers and the three pumps delivered through 16-inch diameter cast iron pipes against a vertical head (after the collapse of the sough tunnel) of approximately 180 yards. 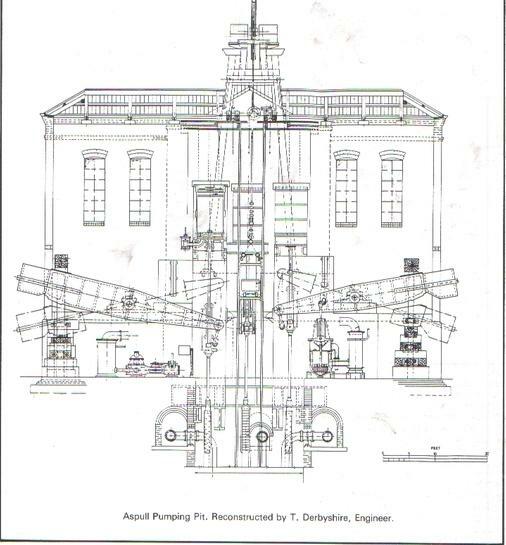 By December 1876 the whole job had been completed, including the engine houses, the winding, the capstan engine, the head frame, the gantries and all the boiler plant. The latter in 1895 consisted of 5 Lancashire boilers. 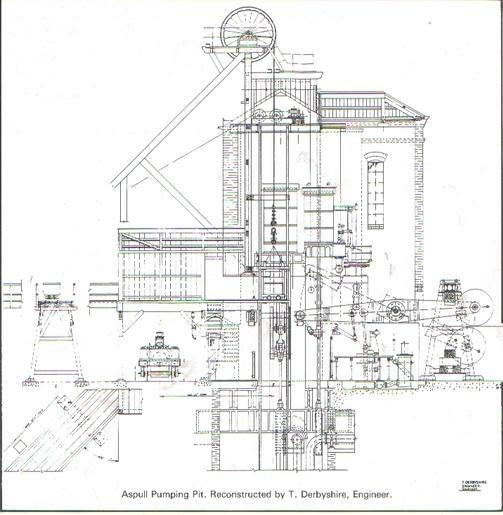 A mining engineer with the Wigan Coal & Iron Company, Ernest Holt, said that these great pumping engines made a big noise when working, snorting, groaning and shaking everything when the pistons came to the end of their stroke. A report from Mr A Bertram, the Chief Engineer to Mr J Hilton, Head Surveyor and Mining Engineer, stated that for the year 1883 the 60 in engine had pumped 172,525,540 gallons from the King Coal and 63,847,219 gallons of clean water from the Cannel. Mr e Mawdesley formerly of the Coal Board, worked at the Pumping Pit as a boy and said the water from the Scot Lane area flowing past NO4 Pit to the underground pump lodges resembled a river in spate. In 1886 a problem arose with Park Hall or Arley Main Colliery, Blackrod. This had been worked for upwards of 20 years by Ridgeway & Co under Roger Leighs estate. By November 1885 the seams were becoming exhausted and Ridgeways gave notice determining the lease. Wigan Coal & Iron Co then decided to take over the colliery in order to continue working the pumps until an aqueduct had been constructed to convey Ridgeways water through Scot Lane workings to Aspull Pumping Pit. The make of water at Ridgeways was 210,000 gallons per day. They had worked to a fault under Red Moss at Horwich. This moss has been described as notorious. The waterway from Ridgeways to Scot Lane No5 to connect with that from Scot Lane to Aspull pumps was made under an agreement between Wigan Coal & Iron Co and Elias Dorning, part owner of Park Hall Estate. Two parallel roads 6ft wide were to be driven in the King Seam. Rock tunnels through a 10yd fault to Ridgeways pumping pit connected these. From Dornings estate the water ran downhill in roads in the King and along a tunnel through a 25yd fault near Scot Lane No1 shaft. Through the fault and exactly opposite was the Canel mine. The water was then led down the shaft from the Cannel mouthing in rectangular wooden spouts to a waterway running due south in the King Coal below. This ran past the Scot Lane No4 Cannel Pit, downhill into the underground lodges of the Aspull Pumping Pit. At the Pumping Pit there were three Siemens transformers in the sub-station building, a separate cable running from each of these to each pump underground.